Get prepared to be completely amazed at what this most luxurious and one of the newest "all-inclusive" resorts in Destin offers. 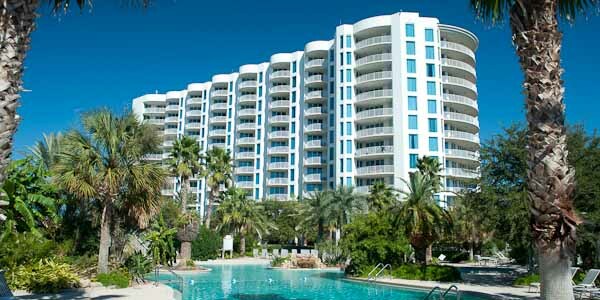 Built in 2007, The Palms of Destin Condominiums have more amenities, entertainment, conveniences and extras than just about any resort in Northwest Florida. The list of amenities goes on and on, but here is a sampling:<br/ > Picture an elegantly landscaped lagoon pool with waterfall, an endless salt water pool, a kiddie pool, grassy playground, park, and arcade for kids, tennis courts, fitness facilities, and huge hot tub. You will find a full-service spa offering massage, manicures and pedicures, a hair salon, and a health and beauty aids store. There is a fine dining restaurant and bar on-site, and another outdoor pool bar for sandwiches. A gift shop, as well as a store for sundries, provides everything you might have forgotten to bring or want to take home to brag. There is also a ballroom, and conference rooms available. Condos come in several floorplans. There are compact two bedrooms - with 1075 square feet around $125,000. Spacious two bedrooms offer 1440 square feet and run around $240,000 to 280,000. Three bedroom units feature 1780 square feet of space and have prices under $400,000. A special group of 1800 square foot single-story two-bedroom villas that are steps from the lagoon pool are around $250,000. The villas present more privacy and easier access in and out. Inside, the condos and villas have every convenience imaginable, as much glass as possible; all the upgrades like granite counter tops and designer furnishings. The Palms are not directly on the beach, but the higher floors offer a view of the beach and overlook those tropical themed pools below. There is a free shuttle to take you one block to the beach. You will not find a better vacation home in the state with these kinds of amenities, and the beautiful environs in Destin make it complete. Let us show you around this magnificent resort.